Jafar looks and sounds like a cosplayer. And not even a good one. I’m kind of peeved for Will Smith that he’s getting so much flack—because there’s a ton in this trailer that deserves just as much negative attention. There’s a few people I’ve seen say that the parts of Aladdin and Jasmine should’ve gone to the leads of Slumdog Millionaire. After looking them up they definitely look the part and while I don’t really remember the movie I bet they’re great actors too. For Jafar, even though he was already in Jungle Book, Ben Kingsley would’ve been a great choice imo. I don’t have faith in any of the upcoming live-action Disney movies. Still will be catching this is theaters though. Not gonna lie or beat around the bush. Yea he would have been a good choice. He was great in the prince of persia movie where he played Nizam, a very similar character to Jafar. It's going to feel weird rooting for Jafar because he's hotter than Aladdin. It looks like a bargain-budget Disney Channel movie. Hell, freakin KIM POSSIBLE looks more lifelike than Aladdin. No. 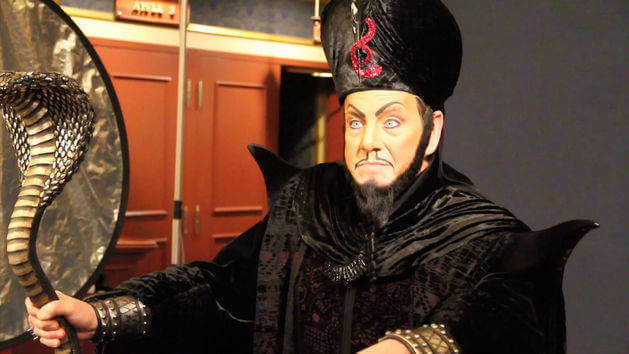 I would have brought back Jonathan Freeman, given that he IS Jafar, voicing him in the original, all the Disney media, and also originating him in the 'Aladdin' Broadway run. But alas, in our modern SJW age, Freeman would be considered "whitewashing" or "brownface" or whatever. Despite the fact that the man IS Jafar. Here he is reading TripAdvisor reviews of the play in character. Have a middle-eastern actor in the role, but have Freeman overdub the voice. THEN, as a cameo....have Freeman himself be Jafar in the old man disguise. Which apparently is not happening in this movie. Because we see Jafar leading Aladdin to the cave. Which apparently is just a cave. No magic scarab artifact to create it. PS. Is Gilbert Gottfried coming back? He was actually in the play?!?! This might be the one (big) Disney live-action remake that actually bombs. So... title of this thread. The supposed all-genie live-action prequel to Aladdin. That's looking like it'll be well received if it happens... no? My money is on Dumbo. Maybe we'll get lucky and they'll both do poorly? Gosh that man has an amazing voice. The trailer threw me off because Jafar just doesn’t sound like Jafar. Iago will be in the movie, but since we haven’t heard anything about a voice, my guess is he isn’t speaking. Jafar will have a henchman named Hakim though. Ellis points out what I hated from the very beginning: the screenwriters were so focused on being "woke" that they completely ruined the entire movie by slapping on this "what REAL feminists think" veneer on it by making Belle live in a town full of raging misogynists. In the original movie, there was no "Women READING?! HARUMPH HARUMPH HARUMPH!" No. 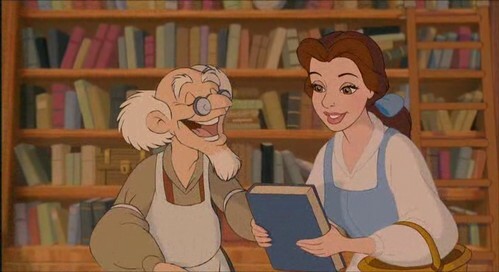 The townsfolk acknowledged that Belle was a reader, with the bookseller/librarian guy even ENCOURAGING it. Their criticism was that she was so wrapped up in books that she wasn't paying attention to the real world she was living in. That's not anti-feminist....it's a VALID criticism, or at least it was when YODA HAD THE EXACT SAME CRITICISM OF LUKE SKYWALKER IN EMPIRE STRIKES BACK! "This one, for a long time I have watched. All his life, he looked away to the horizon, to the future. Never his mind on WHERE HE WAS or WHAT HE WAS DOING. Adventure? Heh. Excitement? Heh. A Jedi craves not these things!" (speaking of Star Wars, i faced the same criticism myself from my own parents when i outright refused to go to the high school prom because i was busy reading Enemy Lines I: Rebel Dream that weekend. Because OF COURSE I'd rather spend time with Wedge Antilles than the classmates who annoyed me. RIP good Star Wars books. I also hate that they shoehorned the "veteran of ??? war" angle to Gaston. The entire point of the character in the original is that Gaston's "greatness" was unearned; the town just put him up as a hero because he was handsome, muscular, and liked to hunt. In the original Gaston was the only one that outright said women shouldn’t read. And he was the villain. Honestly though I haven’t watched the remake again since theaters but I remember enjoying it enough. I moderately enjoyed it in theaters. Parts of it were meh (the entire “Belle” number was a highlight of BatB ‘91 but forgettable in live action; the town looked more like a set than a lived-in place; Emma Watson isn’t a singer and relied on too much auto-tune; the enchanted characters looked weird in CGI) and parts of it I really liked (Audra McDonald mainly; the ‘death’ of the enchanted objects was also a powerful moment in theaters). It was entertaining enough as a popcorn flick. But all of Lindsay’s knocks on the film are valid, and considering that was how Disney interpreted their arguably least-flawed animated film, it’s not a good sign for the rest of the pipeline. Aladdin in particular was quite flawed yet lives on for its early (but ironically dated) uses of CGI and iconic Robin Williams performance. So it figures Disney would lean into the CGI, yet worse (considering what’s possible in 2019, whereas Aladdin ‘92 was a pioneer) and have everyone raging about the genie. From Aladdin's blank expression to Jafar's bland delivery to the uncanny valley that is Iago the ordinary CGI parrot to the setting that looks straight out of a green screen in Georgia (you've been overplaying that card, Disney) or Bollywood (? ), this looks like a straight-up pass. And that's overlooking the Genie for now. Oh well. Here's hoping The Lion King isn't a trainwreck. Did they really CGI a macaw? That’s lazy as hell. Macaws are exceedingly friendly and social parrots.